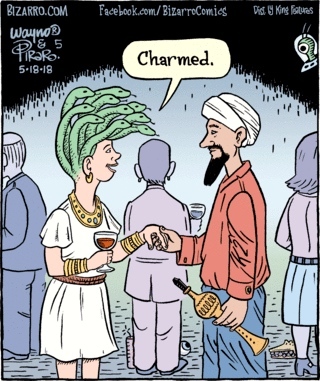 Three things to recognize: the figure of Medusa, the figure of the (Indian) snake handler, and the politeness formula charmed. And then, of course, you need to know that such snake handlers are conventionally known as snake charmers in English and that the politeness formula is part of the social ritual of introduction, where it serves as an alternative to Pleased / Pleasure / Nice to meet you, formal How do you do?, and the like. You are currently browsing the archives for the Conversational formulas category.